I'm having problems getting the center to match. Any tricks? Sew just one pair of the one-tenth units together at a time. Press the seam open. Add another section, again matching, and again ironing the seam allowance open. Sew five together to make a half. Repeat for the other half. The halves should be straight across without any bowing. If not check your seam allowances to be sure they're even (ie. the width of the seam at the wide and narrow end are the same). If they're the same, then the bowing may be caused by ironing. Repress to reshape. Sew the two halves together, carefully matching the center points. I usually sew the center portion (about 2") first with long stitches, then check for matching, especially if I'm having problems. I hope these suggestions are helpful! 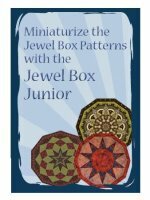 Can I make the Jewel Box Patterns smaller with my Jewel Box Junior? 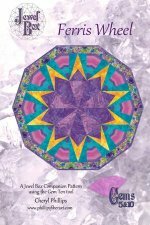 Yes we have conversion charts for some of the Jewel Box patterns. Click here to select your pattern. 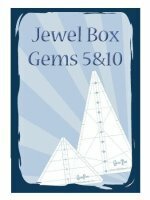 You can easily frame any of the Jewel Box 10 sided shapes. Click here to see more Jewel Box designs. Here are additional instructions for cutting the framing pieces. BOTH the Full size and the Junior tool includes the framing templates with the packaging. If you do not have the framing templates, you can order a set here. 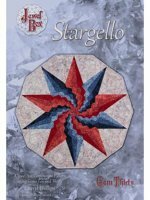 How do you bind the Jewel Box quilts? If you need some suggestions and tips for binding the Jewel Box 10 sided designs (decagons), here is a great download for you! For the G fabric, should the strips be cut 10.5" (per the chart at the top of page 2) or 11" (per the final step on page 3)? Either the 10.5 or the 11" G fabric will work. Sorry for the confusion. I decided to increase it to 11" just to be on the safe side, yet failed to catch the second reference to that number. For the five F and C triangles cut with the Gem 10 (middle of page 3), where do the necessary 3" strips come from? 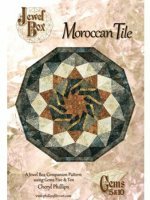 What is the correct size for the Moroccan Tile project or the Water Wheel? The project listed on the pattern IS correct, 45" x 47". It was listed incorrectly listed in the old Keepsake catalog. I'm having problems with the Template page inserts. What should the height of the Gem Five tool really be? Download the conversion charts here!